Immuzac® is a Yunzhi & Lingzhi-derived standardized natural health product containing highly concentrated standardized immunostimulatory polysaccharides. Its ingredient is proven1 to be effective in strengthening one’s immune functions in defense against infection, thereby increasing one’s resistance to illnesses. Immuzac® is especially suitable for front line medical professionals, people who have frequent contacts with patients or those who are constantly exposed to an environment with contamination. The body’s immune cells would be stimulated spontaneously when being exposed to pathogens without overstressing the overall immune system and body functions unnecessarily. Immuzac® is a preventive health product to guard against diseases and to maintain vitality. Immuzac® is the result of a joint research by The University of Hong Kong using an advanced proprietary research technology1. Research experiments are conducted using molecular biotechnology to repeatedly test against efficacy and mechanistic pathways. Two sets of human cell are used in each round to investigate how Immuzac®’s ingredient increases the host resistance against infection. Objective: To investigate the direct stimulatory effect of Immuzac®’s main ingredient (Yunzhi) on dormant human macrophage. Methodology: Human macrophages were cultured with different concentrations of Immuzac®’s main ingredient – PuB. The amount of secreted cytokines was assessed to determine the relative potency of direct stimulatory effects. Immuzac®’s main ingredient PuB appeared to have no significant direct stimulatory effect on human macrophages. This result indicated that it would not stimulate human macrophages under normal condition. Objective: To investigate if Immuzac®’s main ingredient PuB has priming effect on human macrophages for the defense against pathogens. Methodology: Human macrophages were first cultured with different concentrations of Immuzac®’s main ingredient PuB. PuB-primed macrophages were then cultured with infectious agent. The amount of cytokines was assessed to determine the relative priming effect. The experiment showed that macrophages primed with Immuzac®’s main ingredient PuB can secrete a higher amount of cytokines mRNA (β Interferon) as indicated by real-time PCR, thereby strengthening its defense against microbial invasion. The amount of cytokines secreted (β Interferon) is positively correlated with the concentration of Immuzac®’s main ingredient PuB, indicating the dose dependency relationship. The concentration of Immuzac®’s main ingredient PuB required to trigger the immune response is very low, implicating that a physiologically effective concentration of PuB is achievable in low dosage. Immuzac®’s main ingredient PuB possesses strong immunostimulatory effects. PuB probably has similar potency as that of Interferon γ (a therapeutic protein for stimulating cytokines secretion), but has no significant adverse effects. 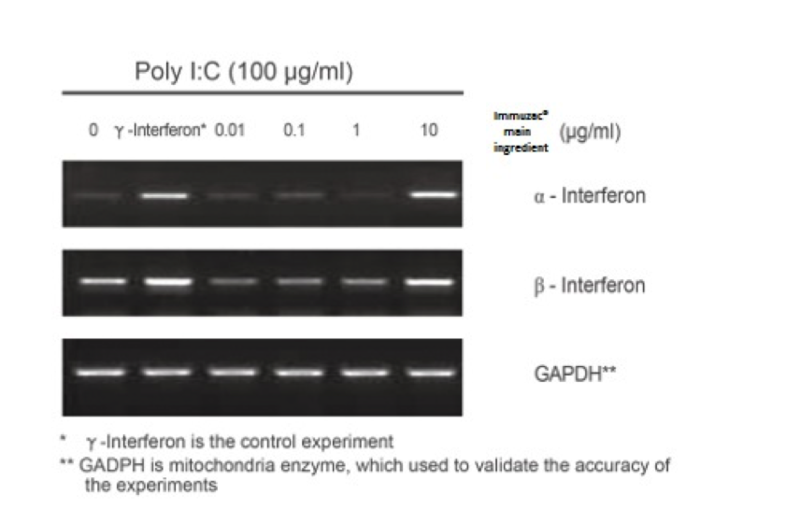 Indicated by Enzyme-Linked Immunosorbant Assay (ELISA), the protein level of secreted cytokines (β Interferon) is positively correlated with the concentration of PuB, further indicating its efficacy. From the research, it is demonstrated that Immuzac®’s main ingredient PuB can activate normal macrophages but will not further induce them to functional state without the contact of infectious agents. Immuzac® prepares the human body to fight against invasion against infectious agents, yet it would not put the immune system under stress. It is suitable for front line medical professionals, people who have frequent contacts with patients or those who are constantly exposed to an environment with contamination. The major active ingredient of Yunzhi is Yunzhi Polysaccharides. Recent scientific researches and clinical trials have proven that Yunzhi extract helps stimulate the immune system2,3. Lingzhi contains polysaccharides, triterpenoids, adenosine and trace elements, each having their own outstanding effects. Polysaccharides can improve the functions of the immune system. Triterpenoids may assist in stabilizing cholesterol and can protect the liver. Adenosine can inhibit platelet aggregation, thus maintaining good blood circulation. Trace elements, such as Germanium, can increase the oxygen carrying capacity of the blood, thus promoting metabolism. Apart from boosting immunity and defending invasion against infectious agents, Immuzac® possesses health strengthening functions and is a balanced preventative health product specifically made for medical professionals. Chu K.K.W., Chow A.H.L. “Preparation and Standardization of Immunodulatory Peptide-Linked Glucans with Verifiable Oral Absorbability from Coriolus Versicolor”, United States Patent No. : US 7,048,932 B2.